We had many winners the day of the District Conference and Foundation Dinner. I wanted to thank all who helped plan and execute the days events. I am truly grateful to all of you who contributed in many, many ways. Team Horner was a strong challenger with 28,064 points and had the top three clubs in each category. Kansas City collected 1,193 pounds of food! Gladstone gave the most money with a donation of $1250.00 and Excelsior Springs donated the most time with 137 hours! Other Team Horner clubs with impressive statChange s are donations of $1,000 from Independence, $978 and 110 hours of service from the Kansas City Club and $1,032 and 85.50 hours of service from the Waldo Brookside Club. The top total points per club were #1 the Kansas City Club with 6,205 points followed closely by #2 Waldo Brookside with 6,152 points. Team McCoy saw Kirksville Thousand Hills and Trenton donating $1,000 each, Cameron donating $750 and Lathrop donating $700!. Kansas City Plaza collected 452 pounds of food and St. Joe East donated 117 hours of service and Trenton donated 100 hours of service. And that makes Trenton the largest point getter for Team McCoy and #3 overall with 5,000 points! But, there were no losers in this contest as the Food Banks and people of North Missouri Benefited from your generosity. In total 3,048 pounds of food were collected, $10,949.46 was raised and 1,055 hours were spent in your communities. Nicely done District 6040 Rotarians! So who won the Golden Tickets? Mary Jo Eiberger from Cameron won the beach vacation. Mary Jo said she hasn’t had a vacation in 5 years and is looking forward to visiting Daytona Beach in February with her girlfriends. Karen Van Sickle from Saint Joseph Southside won the beautiful Rotary theme necklace donated by Trisha Kennedy. Trisha is currently the Blue Springs Club President. These two ladies made some incredible contributions to the Rotary Foundation that night and I appreciate their generosity and their love for Rotary. ShowMe Rotary PETs is just around the corner on March 29-30, 2019. This year we will be focusing on training the President Elects and President Nominees for our Clubs. There will not be a specific Secretary training tract this year for District 6040 club secretaries. Our District leadership has decided to handle Secretary training; inside the District during April and May, at several sites across the District. We want to have more time for questions and to support our Secretaries differing levels of expertise and we feel this is the best way to handle it. We will be announcing those dates and locations shortly. All of the clubs in our District pay dues to support sending two leaders to ShowMe Rotary PETs. The President Elect is required to attend a PETs training by Rotary International before they can serve their term. Any of your other Club Leaders; but preferably the President Nominee, are also invited to attend. They will be assigned to the President Nominee tract to prepare them for their future leadership positions. Please begin making plans for your clubs President Elects and President Nominees to join us all in Jefferson City at the Capital Plaza Hotel on March 29th and 30th of 2019. 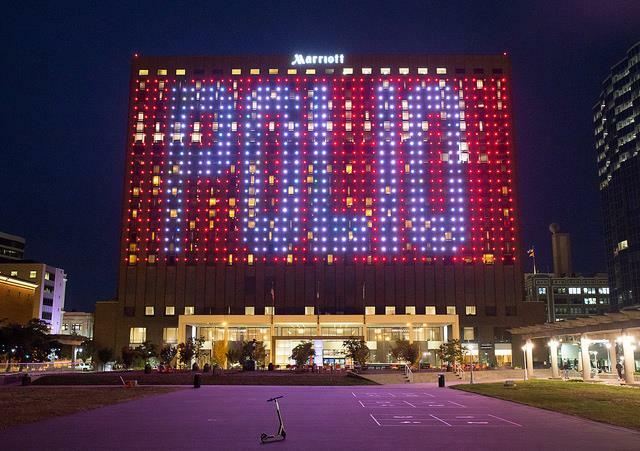 Thanks to the Marriott Downtown, lights shown over downtown to showcase Rotary's fight against Polio. Each month we will highlight another of our GSE Outgoing team members to Australia. This month we would like to introduce Lisa Deatherage. Lisa is a member of Rotary Club of Kansas City Plaza. Lisa also volunteers her time as a ShelterBox Ambassador and is currently the ShelterBox Lead Ambassador for the Midwest. She participates in speaking engagements, community events and other fund raising and awareness activities as well as supporting her husband who is a ShelterBox Response Team member. She has been working with ShelterBox since 2008. Lisa is the Chief Operations Officer of S2000 Corp. a software and service organization with a suite of products providing insurance verification, electronic document issuance and pre-qualification services to companies around the world. We are excited to have Lisa represent the district! This year, 17 District 6040 Rotarians have graduated from the Rotary Leadership Institute (RLI), bringing to 66 the number of District Rotarians to complete the three-day training course designed to build stronger club leaders and, ultimately, stronger and better clubs. Since the start of the RLI program in District 6040 in August 2014, some 130 Rotarians from 28 different clubs have attended one or more of the training sessions. Sessions were held in St. Joseph (twice), Lawson and Chillicothe this year. In 2019, all three Parts of the course will be offered in Chillicothe on March 9, and for the first time ever, we will have evening sessions for Parts II and III in the Kansas City metropolitan area. Tentative dates are March 19 and 26 for Part II and April 9 and 16 for Part III (locations TBD). Participation on both dates will be required to complete each Part. This will make it possible for participants to begin the course in March and graduate in April, if they wish. City Hall hosted 65 high school students for the 25th annual Student Government Day, put together by the Downtown Rotary Club 32 (St. Joseph). The teenagers shadowed department heads such as Police Chief Chris Connally, Fire Chief Mike Dalsing, and City Council members to gain a firsthand look at local government. Students began with a tour of the Police Department, courthouse and area along the Riverfront the city is hoping to develop. Danielle Dotson from St. Joseph Central was mayor for the day. She also was interested in working in government after her experience at City Hall. Club 13 had a great time at Harvesters packaging sweet potatoes and carrots as part of the District 6040 Food Fight. There were 26 volunteers that showed up for a light dinner and socializing before the tour and work began. The tour was very impressive. Club members learned a lot about how it is a regional food bank that serves a 26-county area and how it operates. One in seven people in our region is food insecure. This means they do not know where their next meal is coming from. They also learned that it is one of five regional disaster relief staging sites for Feeding America. They were preparing to provide aid to the people affected by the latest hurricane in the Florida Panhandle. The Blue Springs Rotary Club helped with food sorting for the Blue Springs Community Service League Center. 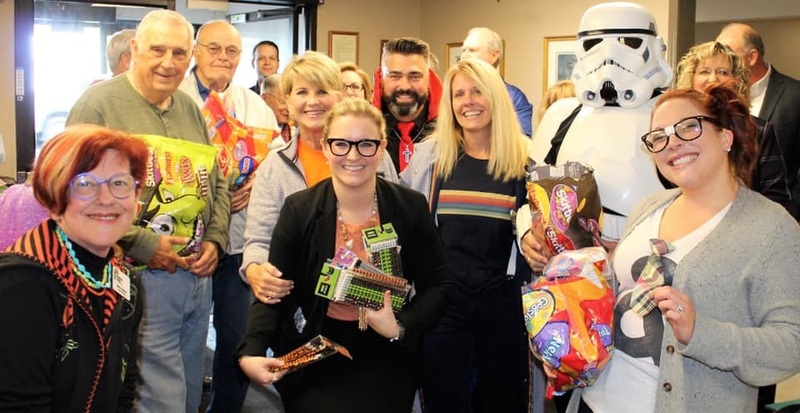 The Blue Springs Rotary Club went to Rainbow Center to hand out candy to the special needs kids instead of their normal Wednesday program on Halloween. 24 rotarians attended, and had a blast!